This page offers Martial Arts Tournament information, News , Photos, Upcoming Championships and Results. Ryoshin-Kan Karate School / Team Dragon Force will support and participate in the The Following Tournaments in 2019. April - Ryoshin-Kan Invitational Spring Break Karate Talent Show Contest - Virginia Beach, Va.
7 April - East Coast Martial Arts Virginia State Championships - Hampton, Va.
TBD - Grand Slam Open National Sport Karate Championships - Richmond, Va.
April - King George Isshin-Ryu Open Karate Championships - King George, Va.
June - Battle of 7 Cities Martial Arts Championships - Norfolk, Va.
See below 2019, 2018, 2017 ...etc Tournament Info / Results. 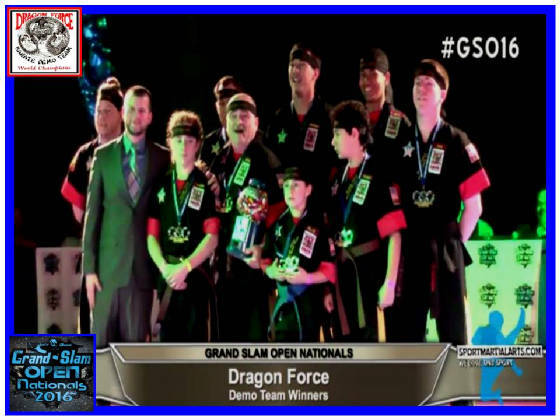 Dragon Force Demo Team Rocked the GSO Nationals 2018! East Coast & VA State Karate Champs 2018! VA State Karate Demo Team Champs 2018! 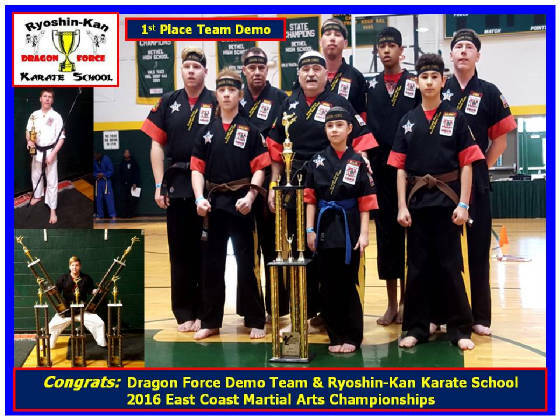 Dragon Force Demo Team & Ryoshin-Kan Rocked 2017 East Coast Championships! Congrats: 2016 World Fall Classic Karate Champions! 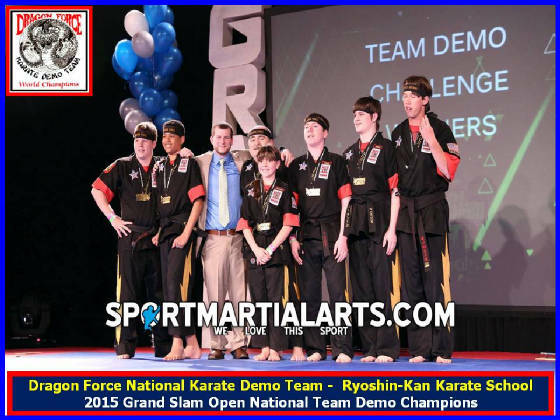 2016 Grand Slam Open Nationals - Demo Team Champs! 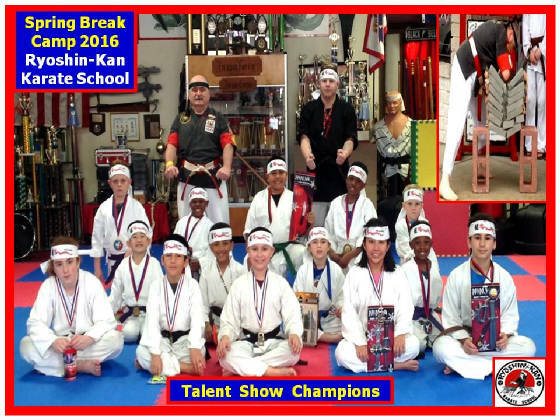 Spring Break Karate Talent Show Champions 2016! 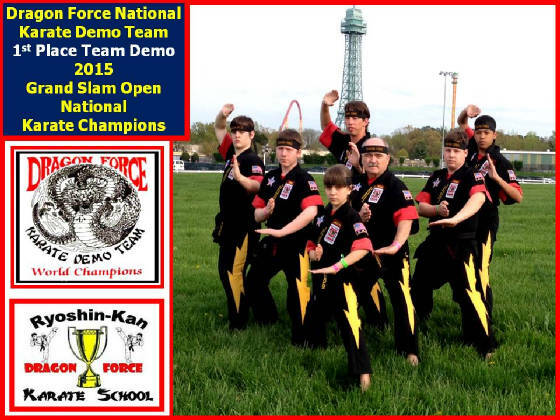 2015 Grand Slam Open National Team Demo Champions! 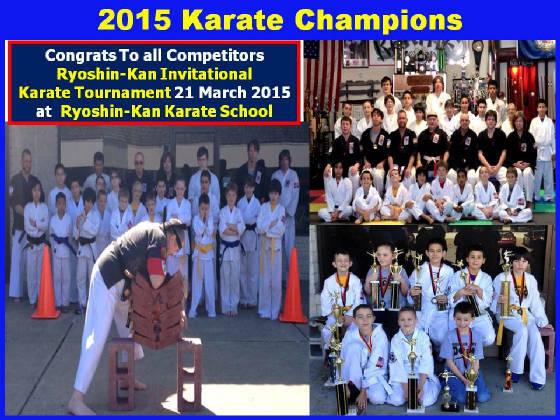 2015 Ryoshin-Kan Invitational Karate Champions! 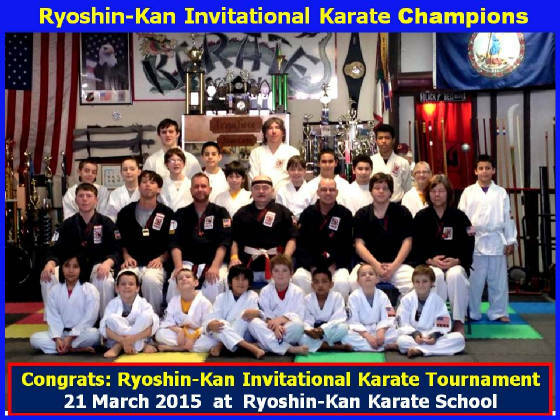 Congratulations to all Competitors, Judges, Parents & Guest on a Great performance and Impressive Victory at the 2015 RK Invitational Karate Tournament that was conducted at Ryoshin-Kan Karate School in Virginia Beach, VA on 21 March 2015. 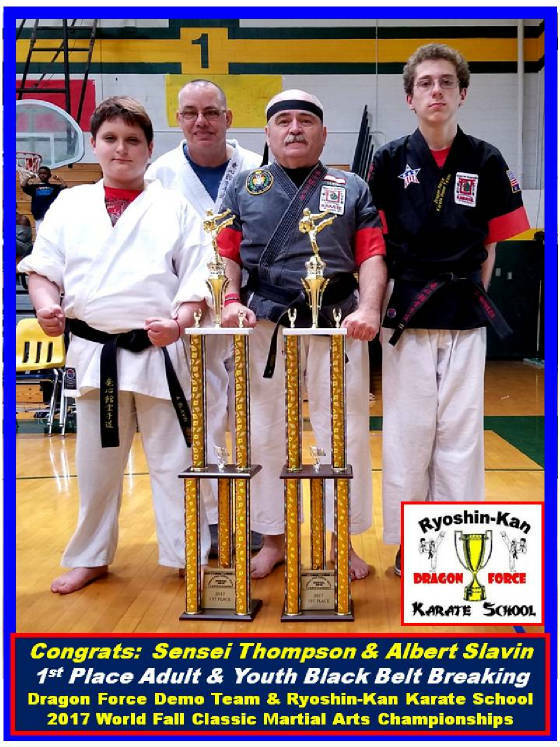 We had a total of 75 Folks from Ryoshin-Kan Karate School and Virginia Area Dojo, Competitors and Parents / Relatives, that represented their Karate School to the highest level. We Awarded a Total of 82 Trophies and Medals. 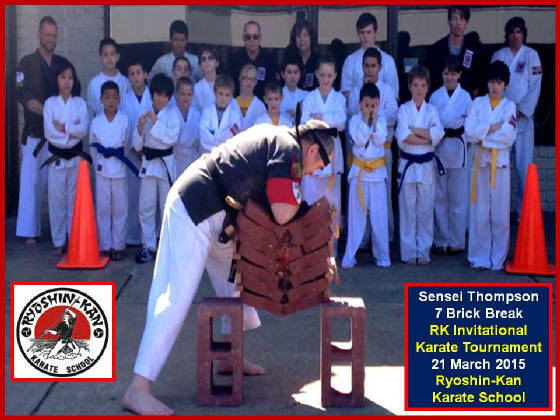 Plus Sensei Thompson Performed a Tameshiwari Demo by Breaking a Stack of 7 Bricks…. After the Tournament we all celebrated by having a Pizza Party. We all had an Awesome time. All of you are Karate Champions! Well Done to the Following Karate Champions and Judges: Sensei Tim Thompson, Sensei Michael Milliman, Sensei Steven Phillips Jr, Sempai Keegan Grinspoon, Sempai Patrick Johnston, Sempai Ellen Honeycutt, Sempai Chris Altman, Noah Caldon, Kai Cheek, Jaclyn Nolen, Mike Dawson, Alondra Duenas, Alejandro Duenas, Alex Hill, Joshua Eby, Ethan Ott, Sammy Assassa, Mark Rizts, Bill Smith, Mille Thorton, Jordan Diaz, Daisia Duncan, Halaina Fiorille, Ethan Corder, Ayden Duncan, Wesley Phillips, Keinar Sequeira, Jovanny Alvarado, Sabastion Kinchen, Anthony Noe, Zane Berezansky. 1st PLACE Team Showmanship: (Team Pairs & Demo Skits) Patrick Johnston, Chris Altman, Kai Cheek, Alondra Duenas, Alejandro Duenas, Joshua Eby, Ethan Ott. 1st PLACE White Belt Kata: Keinar Sequeira, Jovanny Alvarado, Sabastion Kinchen, Anthony Noe, Zane Berezansky. Won 2nd Place to 3rd Place in Various Divisions: Noah Caldon, Alejandro Duenas, Joshua Eby, Ethan Ott, Mark Rizts, Bill Smith, Mille Thorton, Daisia Duncan, Ethan Corder, Ayden Duncan, Keinar Sequeira, Jovanny Alvarado, Anthony Noe, Zane Berezansky. Top Videographers / Photographers: Angel Phillips, Chris Altman, Keegan Grinspoon and all Parents. Congratulations and Thank You to all Ryoshin-Kan Karate School and Virginia Area Dojo Participants, Parents and Friends for your Support. I am very Proud of each and every one of You. All of You are Champions! "Dragon Force Rocked this Tournament!" 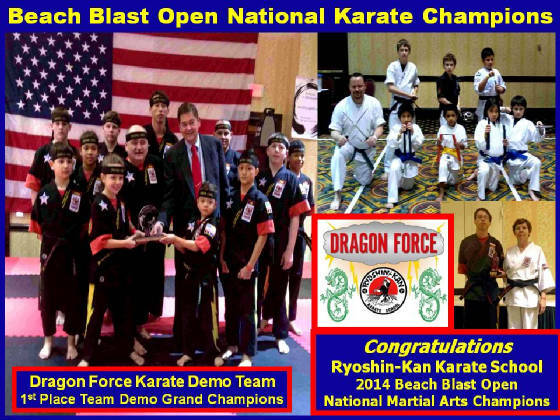 Congratulations and Well Done to the Ryoshin-Kan Karate School's "Team Dragon Force" on an outstanding performance and Impressive Victory at the 2014 Beach Blast Open National Martial Arts Championships that were conducted at the Norfolk Waterside Marriott in Norfolk, Virginia on 14 & 15 February 2014. We had 75 plus Folks from Ryoshin-Kan Karate School, both Competitors and Parents / Relatives, that represented our Dojo to the highest level. 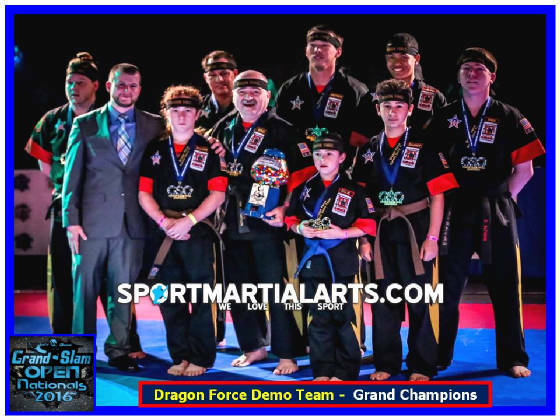 Team Dragon Force had 21 competitors who won a total of 35 Trophies including Team Demo Grand Champion, Team Weapons Grand Champion, Junior Black Belt Sparring Grand Champion, 6 Grand Champion Runnerups and 12 First Place. Alex Thomasson, Alondra Duenas, Alejandro Duenas, Brian Thomasson and Ethan Ott. 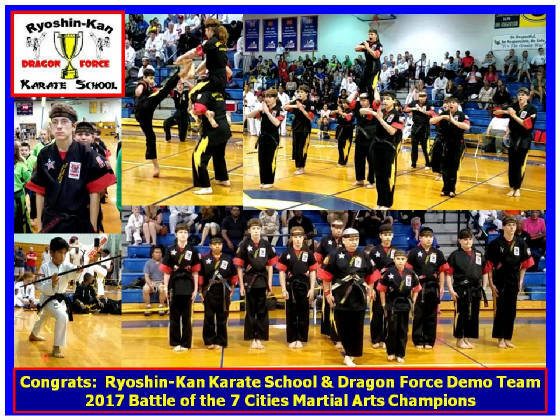 Ryoshin-Kan Karate School / Team Dragon Force had 21 competitors who won a total of 35 Trophies including Team Demo Grand Champion, Team Weapons Grand Champion, Junior Black Belt Sparring Grand Champion, 6 Grand Champion Runnerups and 12 First Place. OohYa! 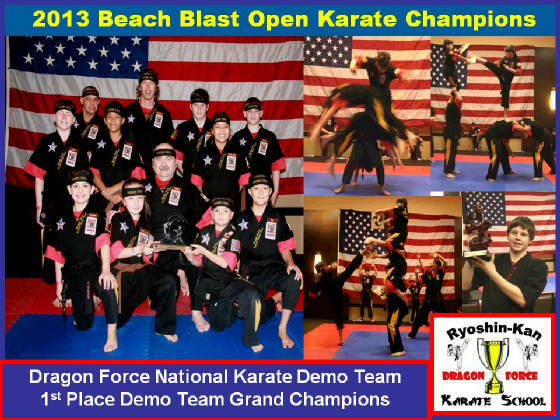 Beach Blast Open Demo Team Grand Champions 2014: Dragon Force National Karate Demo Team: Well Done to Sensei Thompson, Michael Milliman, Patrick Johnston, Keegan Grinspoon, Kai Loree, Chris Altman, Quinn Barson, Dayjha Armstrong, Trent McGarrigle, Kai Cheek, Noah Caldon, and Jaclyn Nolen. The Following also won 2nd to 4th Place in Various Divisions: Patrick Johnston, Kai Loree, Chris Altman, Ellen Honeycutt, Hayden Bowles, Zachary Bowles, Alex Thomasson, Alondra Duenas, Alejandro Duenas, Brian Thomasson and Ethan Ott. Top Helpers/ Assistants: Mike Milliman, Patrick Johnston, Lourie Altman, Chris Altman, Hye Cha Thompson. Top Videographers / Photographers: Stephen Johnston, Keegan Grinspoon, Chris Altman, Steve Altman, Lourie Altman, Penelope Stevens. Top / Best Cheering Section & Support: Team Dragon Force / Ryoshin-Kan Parents, Relatives and Friends! Special Thank You to Patrick Johnston & Mrs. Lourie Altman for scorekeeping, load out, transportation and for always being there to help. Congratulations and Well done to all Participants, Parents and Friends. I am very Proud of each and everyone of You. All of You are Champions! "Awesome Performance by Team Ryoshin-Kan / Dragon Force!" 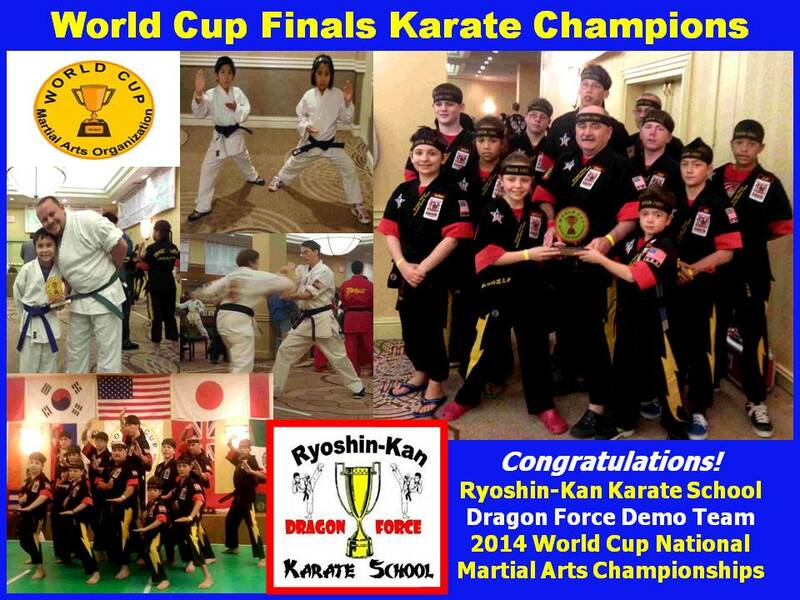 Congratulations to Ryoshin-Kan Karate School & Dragon Force National Karate Demo Team on an Awesome & Impressive performance at the 2014 World Cup Finals National Martial Arts Championships that were conducted in the Washington, D.C. Area on 17 / 18 January 2014. This was an International championships that had competitors from all over the USA (New York, Chicago, Philadelphia, Dallas, San Diego, Washington D.C., Virginia Beach etc...) and from all over the World (Russia, Bermuda, Mexico, Canada, Korea etc...) WOW!!! We had a total of 38 Folks from Ryoshin-Kan Karate School, both Competitors and Parents / Relatives, that represented our Dojo to the highest level. We had 18 competitors who won a total of 42 Trophies including Grand Champion 1st runner up & 5 First Place. Well Done to Sensei Tim Thompson, Michael Milliman, Keegan Grinspoon, Lynwood Yeatts, Patrick Johnston, Kai Loree, Chris Altman, Dayjha Armstrong, Quinn Barson, Ellen Honeycutt, Kai Cheek, Trent McGarrigle, Noah Caldon, Jaclyn Nolen, Alex Thomasson, Alondra Duenas, Alejandro Duenas and Brian Thomasson . We had 38 Folks from Ryoshin-Kan / Team Dragon Force including 18 competitors who won a total of 42 Trophies including Grand Champion 1st runner up & 5 First Place. OohYa! World Cup Demo Team Grand Champs 1st Runner Up out of 12 Demo Teams: Dragon Force National Karate Demo Team * Well Done to Sensei Thompson, Michael Milliman, Keegan Grinspoon, Patrick Johnston, Kai Loree, Chris Altman, Dayjha Armstrong, Quinn Barson, Kai Cheek, Trent McGarrigle, Noah Caldon, and Jaclyn Nolen. The Following also won 3rd Place to Finalist in Various Divisions: Michael Milliman, Keegan Grinspoon, Kai Loree, Chris Altman, Ellen Honeycutt, Kai Cheek, Trent McGarrigle, Noah Caldon, Brian Thomasson. Alex Thomasson, Alondra Duenas, Alejandro Duenas. Top Helpers/ Assistants: Mike Milliman, Patrick Johnston, Keegan Grinspoon, Steve Altman, Lourie Altman, Chris Altman, Quinn Barson, Allen Loree, Kai Loree. Top Videographers / Photographers: Penelope Stevens / Cheek, Steve Altman, Lourie Altman, Allen Loree, Cheryl McGarrigle, Susan Thomasson. Special Thank You to Mrs. Lourie Altman for helping with Tournament Results /record keeping, load out, transportation, headbands, Music Coordinator & for always being there to help. US Gladiator Challenhge National Karate Champions 17 August 2013. 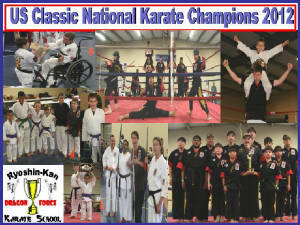 U.S. Classic National Karate Champions 9 February 2013! 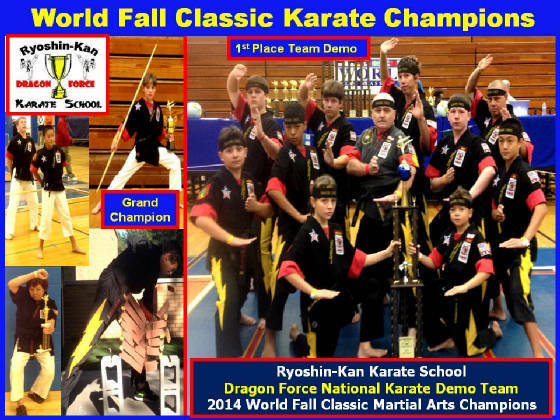 Congratulations to the Ryoshin-Kan Karate School and the Dragon Force National Karate Demo Team on an Awesome performance and Impressive Victory at the 2013 World Fall Classic Martial Arts Championships that were conducted at Hampton University in Hampton, Virginia on 6 October 2013. We had a total of 45 Folks from Ryoshin-Kan Karate School, both Competitors and Parents / Relatives, that represented our Dojo to the highest level. Team Dragon Force had 18 competitors who won a total of 56 Trophies including 2 Grand champions & 25 First Place. 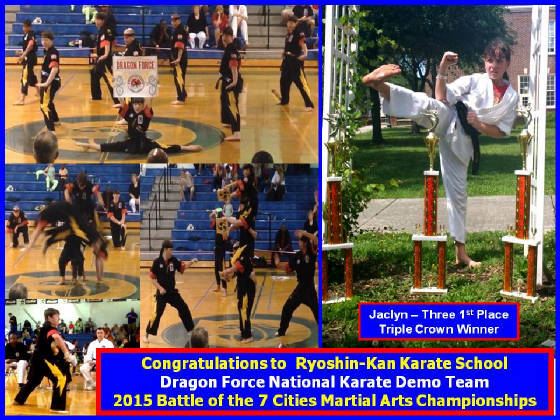 The Dragon Force / Ryoshin-Kan Karate Team did outstanding in all Divisions. We had 45 Folks from Ryoshin-Kan / Team Dragon Force including 18 competitors who won a total of 56 Trophies including 2 Grand Champions & 25 First Place. OohYa! 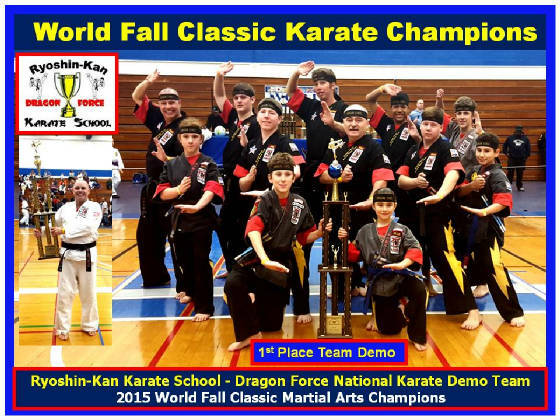 WORLD FALL CLASSIC DEMO TEAM CHAMPIONS: Dragon Force National Karate Demo Team * Well Done to Sensei Thompson, Michael Milliman, Keegan Grinspoon, Patrick Johnston, Kai Loree, Chris Altman, Dayjha Armstrong, Quinn Barson, Kai Cheek, Trent McGarrigle, Noah Caldon, and Jaclyn Nolen. The Following also won 2nd to 3rd Place in Various Divisions: Michael Milliman, Patrick Johnston, Keegan Grinspoon, Kai Loree, Chris Altman, Dayjha Armstrong, Quinn Barson, Kai Cheek, Trent McGarrigle, Noah Caldon, Jaclyn Nolen, Alex Thomasson, Alondra Duenas, Alejandro Duenas and Brian Thomasson. Top Helpers/ Assistants: Mike Milliman, Patrick Johnston, Keegan Grinspoon, Lourie Altman, Chris Altman, Quinn Barson. Top Videographers / Photographers: Stephen Johnston, Penelope Stevens / Cheek, Dan Elder, Lourie Altman. Special Thank You to Mrs. Lourie Altman for Tournament Results record keeping, load out, transportation and for always being there to help. 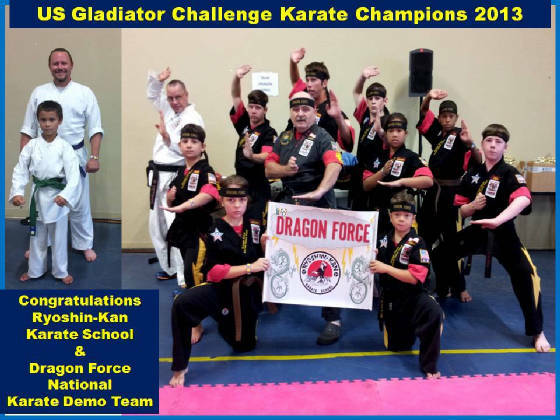 Congratulations and Well Done to the Ryoshin-Kan Karate School's "Team Dragon Force" on an outstanding performance and Impressive Victory at the US Gladiator Challenge National Open Karate Championships that were conducted in Virginia Beach, Virginia on 17 August 2013. We had a total of 38 Folks from Ryoshin-Kan Karate School, both Competitors and Parents / Relatives, that represented our Dojo to the highest level. 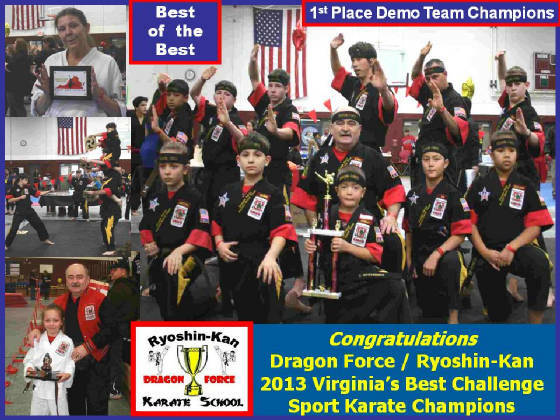 Ryoshin-Kan / Team Dragon Force Won a total of 53 First Place Trophies and Medals. Well Done to Sensei Tim Thompson, Sensei Michael Milliman, Sempai Lynwood Yeatts, Sempai Keegan Grinspoon, Chris Altman, Patrick Johnston, Quinn Barson, Ellen Honeycutt, Dayjha Armstrong, Trent McGarrigle, Kai Cheek, Noah Caldon, Jaclyn Nolen, Alex Thomasson, and Brian Thomasson. We had 38 Folks from Ryoshin-Kan/ Team Dragon Force including 14 competitors who won a total of 85 Trophies / Medals including 63 First Place. OohYa! 1st PLACE Black Belt Self-Defense Team: Keegan Grinspoon, Chris Altman, Quinn Barson, Dayjha Armstrong, Trent McGarrigle. The Following also won 2nd to 3rd Place in Various Divisions: Keegan Grinspoon,Trent McGarrigle, Kai Cheek, Noah Caldon, Alex Thomasson, Brian Thomasson. Special Thank You for Tournament Help (Admin / Set up / Transportation /Load Out/Photography etc...): Lourie Altman, Steve Altman, Patrick Johnston, Chris Altman, Keegan Grinspoon. Thank you to all Parents, Relatives and Ryoshin-Kan Students for the Outstanding Support. 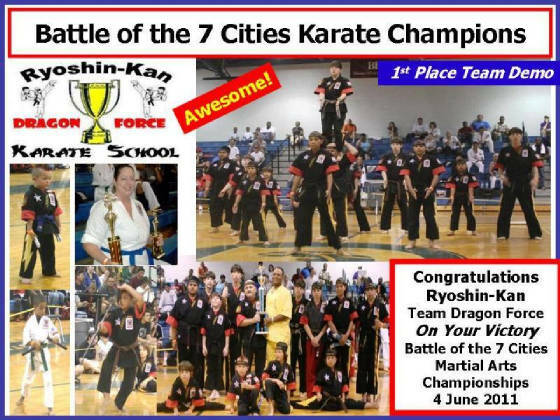 Congratulations to the Ryoshin-Kan Karate School's "Team Dragon Force" on an outstanding performance and Impressive Victory at the Battle of the 7 Cities Martial Arts Championships that were conducted at the Granby High School in Norfolk, Virginia on 8 June 2013. Well Done to Sensei Tim Thompson, Michael Milliman, Patrick Johnston, Keegan Grinspoon, Kai Loree, Chris Altman, Dayjha Armstrong, Quinn Barson, Trent McGarrigle, Kai Cheek, Noah Caldon, Jaclyn Nolen, Alex Thomasson, and Brian Thomasson. 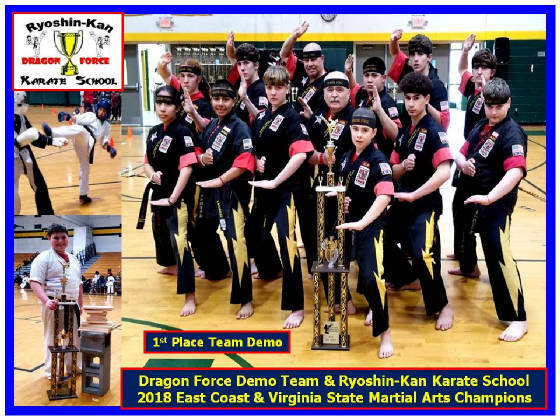 We had 35 Folks from Ryoshin-Kan / Team Dragon Force including 14 competitors who won a total of 32 Trophies including Seven First Place in Team Demo, Weapons, Kata and Sparring. 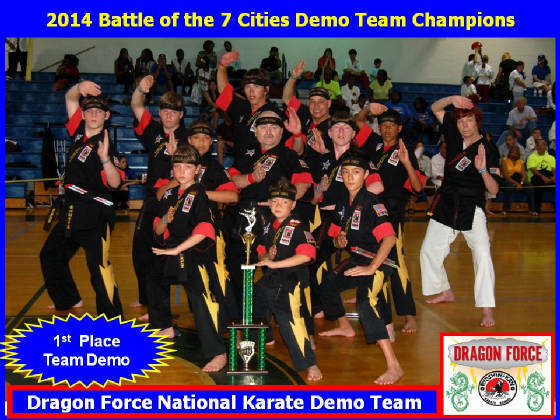 2013 BATTLE of the 7 CITIES DEMO TEAM CHAMPIONS: Dragon Force National Karate Demo Team. Watch Dragon Force Demo Team's Awesome Performance on youtube: http://www.youtube.com/watch?v=P9laslZlWec Well Done to Sensei Tim Thompson, Michael Milliman, Patrick Johnston, Keegan Grinspoon, Kai Loree, Chris Altman, Dayjha Armstrong, Quinn Barson, Trent McGarrigle, Kai Cheek, Noah Caldon, and Jaclyn Nolen. The Following won 2nd to 4th Place in Various Divisions: Michael Milliman, Patrick Johnston, Kai Loree, Chris Altman, Dayjha Armstrong, Quinn Barson, Kai Cheek, Noah Caldon, Jaclyn Nolen, Alex Thomasson and Brian Thomasson. Congratulations and Well Done to all Participants, Students, Parents and Friends. 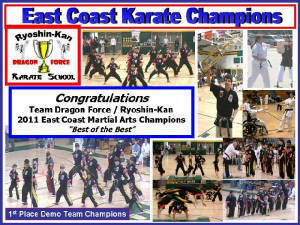 Congratulations and Well Done to the Ryoshin-Kan Karate School's "Team Dragon Force" on an outstanding performance and Impressive Victory at the 2013 East Coast Martial Arts Championships / Tidewater Challenge that was conducted at Bethel High School in Hampton, Virginia on 14 April 2013. We had a total of 43 Folks from Ryoshin-Kan Karate School, both Competitors and Parents / Relatives, that represented our Dojo to the highest level. Team Dragon Force had 16 competitors who won a total of 62 Trophies including 21 First Place. Well Done to Sensei Tim Thompson, Michael Milliman, Patrick Johnston, Keegan Grinspoon, Kai Loree, Chris Altman, Dayjha Armstrong, Quinn Barson, Ellen Honeycutt, Trent McGarrigle, Kai Cheek, Noah Caldon, Jaclyn Nolen, Alex Thomasson, Vincent Cecilia and Brian Thomasson. We had 43 Folks from Ryoshin-Kan / Team Dragon Force including 16 competitors who won a total of 62 Trophies including 21 First Place. OohYa! EAST COAST MARTIAL ARTS / TIDEWATER CHALLENGE DEMO TEAM CHAMPIONS: The Dragon Force National Karate Demo Team are the 2013 East coast Karate Demo Team Champions! *** Well Done to Sensei Tim Thompson, Michael Milliman, Patrick Johnston, Keegan Grinspoon, Kai Loree, Chris Altman, Dayjha Armstrong, Quinn Barson, Trent McGarrigle, Kai Cheek, Noah Caldon and Jaclyn Nolen. 1st PLACE Black Belt Adult / Teenager Self-Defense Team: Keegan Grinspoon,Patrick Johnston, Michael Milliman, Chris Altman. The Following also won 2nd to Finalist in Various Divisions: Michael Milliman, Patrick Johnston, Keegan Grinspoon, Kai Loree, Chris Altman, Dayjha Armstrong, Quinn Barson, Ellen Honeycutt, Trent McGarrigle, Kai Cheek, Noah Caldon, Jaclyn Nolen, Alex Thomasson, Vincent Cecilia and Brian Thomasson. Top Helpers/ Assistants: Mike Milliman, Keegan Grinspoon, Lourie Altman, Chris Altman, Patrick Johnston. Top Videographers / Photographers: Stephen Johnston, Lourie Altman, Brian Thomasson. Congratulations and Well done to all Participants, Parents and Friends. I am very Proud of each and everyone of You. Congratulations and Well Done to the Ryoshin-Kan Karate School's "Team Dragon Force" on an outstanding performance and Impressive Victory at the 2013 Beach Blast Open Martial Arts Championships that were conducted at the Holiday Inn & Conference Center in Virginia Beach, Virginia on 22 & 23 February 2013. We had a total of 45 Folks from Ryoshin-Kan Karate School, both Competitors and Parents / Relatives, that represented our Dojo to the highest level. Team Dragon Force had 14 competitors who won a total of 18 Trophies including Team Demo Grand Champion, 2 Grand Champion Runnerups, 3 Grand Champion Semi Finalist and 7 First Place. Well Done to Sensei Tim Thompson, Michael Milliman, Patrick Johnston, Keegan Grinspoon, Kai Loree, Chris Altman, Dayjha Armstrong, Quinn Barson, Ellen Honeycutt, Trent McGarrigle, Kai Cheek, Noah Caldon, Jaclyn Nolen and Brian Thomasson. 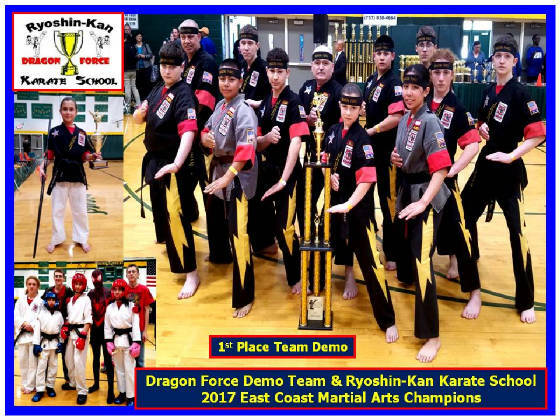 We had 45 Folks from Ryoshin-Kan / Team Dragon Force including 14 competitors who won a total of 18 Trophies including Team Demo Grand Champions, Two Grand Champion Runnerups, Three Grand Champion Semi Finalist and 7 First Place. OohYa! 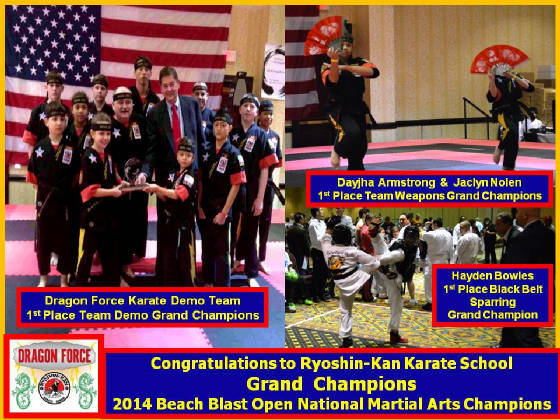 BEACH BLAST MARTIAL ARTS DEMO TEAM GRAND CHAMPIONS 2013: Dragon Force Demo Team Grand Champions! *** Well Done to Sensei Thompson, Michael Milliman, Patrick Johnston, Keegan Grinspoon, Kai Loree, Chris Altman, Quinn Barson, Dayjha Armstrong, Trent McGarrigle, Kai Cheek, Noah Caldon, and Jaclyn Nolen. The Following also won 2nd to 4th Place in Various Divisions: Michael Milliman, Keegan Grinspoon, Chris Altman, Ellen Honeycutt, Kai Cheek and Brian Thomasson. Top Helpers/ Assistants: Mike Milliman, Patrick Johnston, Keegan Grinspoon, Steve Altman, Lourie Altman, Chris Altman. Top Videographers / Photographers: Stephen Johnston, Steve Altman, Lourie Altman. Top / Best Cheering Section & Support: Team Dragon Force Parents, Relatives and Friends! Special Thank You to Mrs. Lourie Altman for scorekeeping, load out, transportation and for always being there to help. Congratulations and Well Done to the Ryoshin-Kan Karate School's "Team Dragon Force" on an outstanding performance and Impressive Victory at the US Classic National Open Karate Championships that were conducted in Virginia Beach, Virginia on 9 February 2013. We had a total of 54 Folks from Ryoshin-Kan Karate School, both Competitors and Parents / Relatives, that represented our Dojo to the highest level. 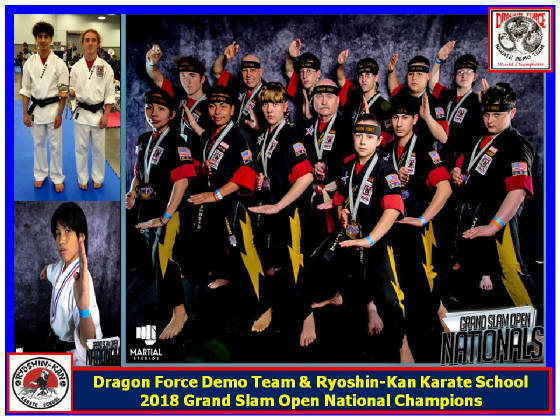 Ryoshin-Kan / Team Dragon Force Won a total of 85 Trophies and Medals including Team Demo Grand Champion National Trophy and 63 First Place Trophies. Well Done to Sensei Tim Thompson, Sensei Michael Milliman, Sempai Lynwood Yeatts, Sempai Keegan Grinspoon, Kai Loree, Chris Altman, Patrick Johnston, Quinn Barson, Hayden Bowles, Zachary Bowles, Ellen Honeycutt, Dayjha Armstrong, Nick Solt, Trent McGarrigle, Kai Cheek, Noah Caldon, Jaclyn Nolen, Alex Thomasson, Vincent Cecilia. We had 54 Folks from Ryoshin-Kan/ Team Dragon Force including 19 competitors who won a total of 85 Trophies / Medals including 63 First Place. OohYa! 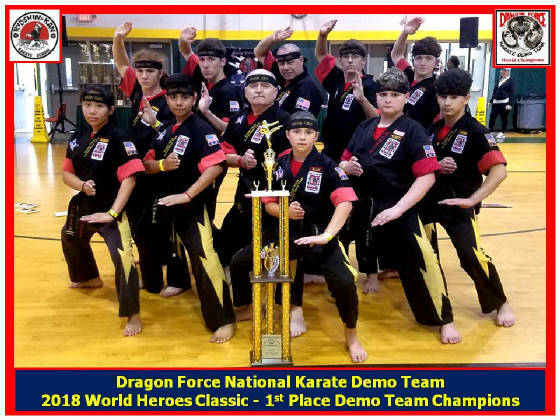 U.S. CLASSIC National Karate Demo Team Grand Champions: The Dragon Force National Karate Demo Team was Awarded the US Classic National Professional Karate Demo Team 1st Place Grand Champion Trophy. *** Well Done to Sensei Thompson, Michael Milliman, Keegan Grinspoon, Kai Loree, Chris Altman, Patrick Johnston, Quinn Barson, Dayjha Armstrong, Trent McGarrigle, Kai Cheek, Noah Caldon, Jaclyn Nolen. 1st PLACE Black Belt Youth Self-Defense: Chris Altman, Quinn Barson, Hayden Bowles, Zachary Bowles, Dayjha Armstrong, Trent McGarrigle. The Following also won 2nd to 3rd Place in Various Divisions: Keegan Grinspoon, Kai Loree, Chris Altman,Quinn Barson, Hayden Bowles, Zachary Bowles, Dayjha Armstrong, Nick Solt, Trent McGarrigle, Kai Cheek, Noah Caldon, Alex Thomasson, Vincent Cecilia. Special Thank You for Tournament Help (Admin / Set up / Transportation /Load Out/Photography etc...): Michael Milliman, Lourie Altman, Steve Altman, Patrick Johnston, Chris Altman, Stephen Johnston, Anne Johnston, Sharon Elder, Keegan Grinspoon. Congratulations and Well Done to the Ryoshin-Kan Karate School's, Team Dragon Force on an outstanding performance and Impressive Victory at the 2013 Virginia's Best Challenge Sports Martial Arts Championships that were conducted at Amherst County High School Gymnasium in Amherst, Virginia (Lynchburg Area) on 26 January 2013. We made it through the Snow Storm and the Karate Tournament. We had a total of 25 Folks from Ryoshin-Kan Karate School, both Competitors and Parents / Relatives, that represented our Dojo to the highest level. 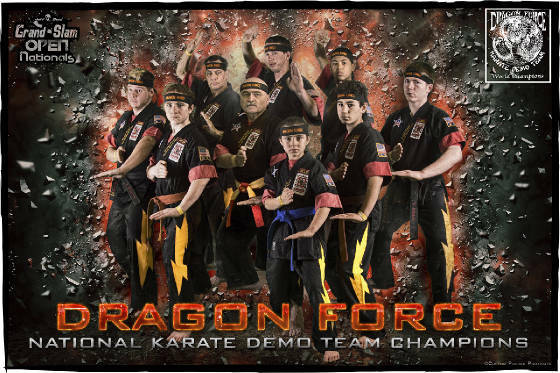 Team Dragon Force had 13 competitors who won a total of 29 Trophies including 18 First Place and a Grand Champion Trophy. Well Done to Sensei Tim Thompson, Michael Milliman, Patrick Johnston, Keegan Grinspoon, Kai Loree, Chris Altman, Dayjha Armstrong, Quinn Barson, Ellen Honeycutt, Trent McGarrigle, Kai Cheek, Noah Caldon and Jaclyn Nolen. We had 25 Folks from Ryoshin-Kan / Team Dragon Force including 13 competitors who won a total of 29 Trophies including 18 First Place and a Grand Champion Trophy. OohYa! 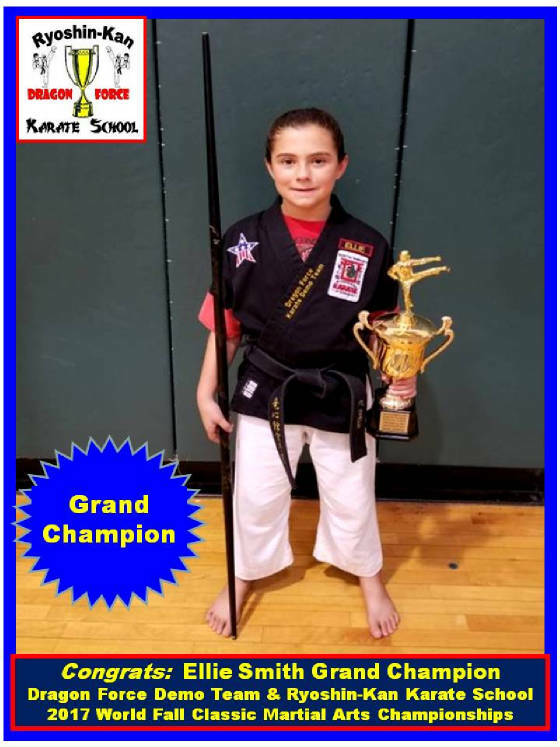 *** Well Done to Sensei Thompson, Michael Milliman, Patrick Johnston, Keegan Grinspoon, Kai Loree, Chris Altman, Dayjha Armstrong, Quinn Barson, Kai Cheek, Trent McGarrigle, Noah Caldon, and Jaclyn Nolen. The Following also won 2nd to Finalist in Various Divisions: Patrick Johnston, Kai Loree, Chris Altman, Kai Cheek, Trent McGarrigle, Noah Caldon, Jaclyn Nolen. Top Helpers/ Assistants: Mike Milliman, Patrick Johnston, Keegan Grinspoon, Steven Altman, Lourie Altman, Chris Altman, Stephen Johnston. Top Videographers / Photographers: Stephen Johnston, Lourie Altman. Special Thank You to All Parents and Students for all your support. 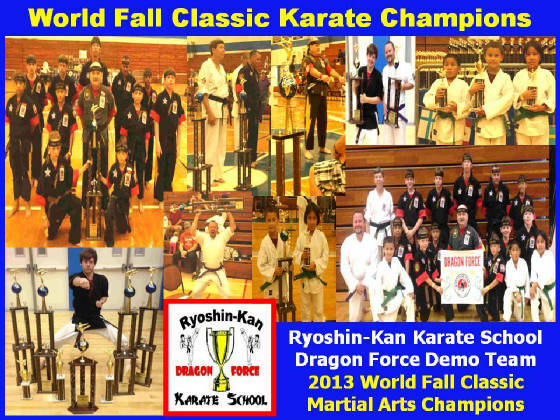 Team Dragon Force / Ryoshin-Kan Rocked the 2012 World Fall Classic Championships. Congratulations and Well Done to all Participants of the 26th Battle of the Martial Arts National Championships 14 January 2012 in the Baltimore, Maryland area. 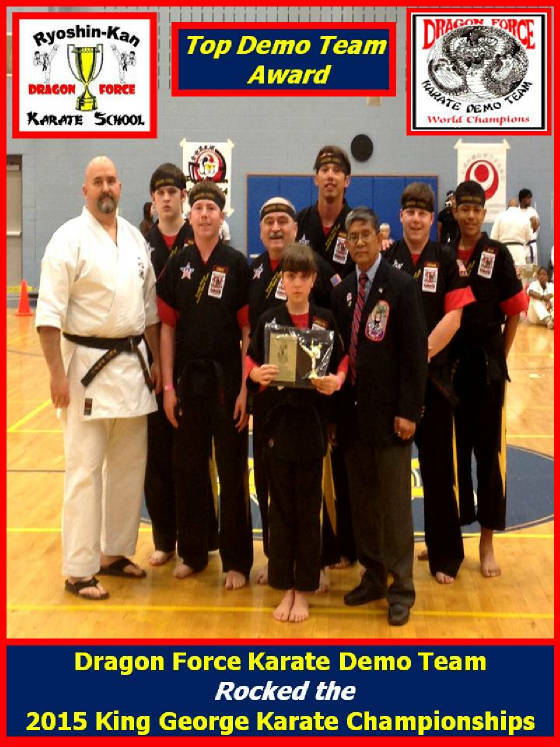 Ryoshin-Kan Karate School and Golden Sun Dojo took a Tour Bus to this tournament that was Located at Middle River School Gymnasium in Maryland. 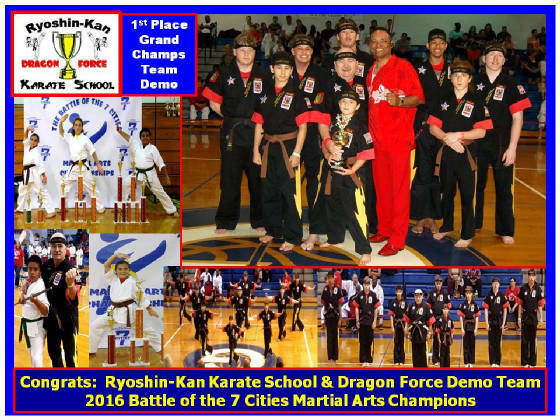 This was a Great Tournament and Ryoshin-Kan / Team Dragon Force did very Well and Won Two Grand Champion Trophies as well as 1st Place Trophies in Team Demo, Kata, Weapons, Sparring. 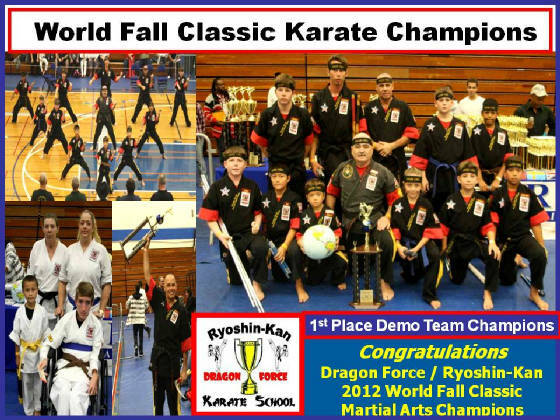 Congratulations and Well Done to the Ryoshin-Kan Karate School's "Team Dragon Force" on an outstanding performance and Impressive Victory at the 2012 World Fall Classic Martial Arts Championships that were conducted at Hampton University in Hampton, Virginia on 7 October 2012. We had a total of 48 Folks from Ryoshin-Kan Karate School, both Competitors and Parents / Relatives, that represented our Dojo to the highest level. Team Dragon Force had 16 competitors who won a total of 56 Trophies including 25 First Place. Well Done to Sensei Tim Thompson, Michael Milliman, Patrick Johnston, Keegan Grinspoon, Kai Loree, Chris Altman, Dayjha Armstrong, Quinn Barson, Ellen Honeycutt, Nick Solt, Kai Cheek, Trent McGarrigle, Christy Green, Noah Caldon, Jaclyn Nolen and Alex Thomasson. We had 48 Folks from Ryoshin-Kan / Team Dragon Force including 16 competitors who won a total of 56 Trophies including 25 First Place. OohYa! 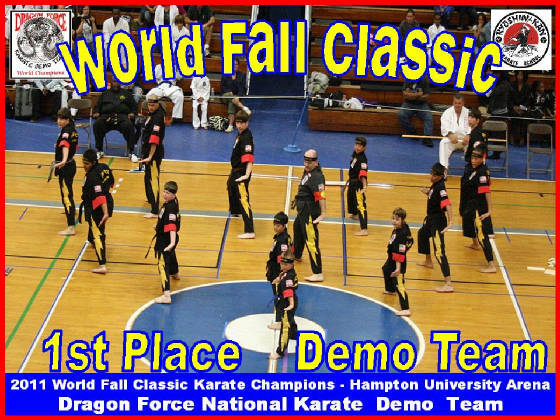 WORLD FALL CLASSIC MARTIAL ARTS DEMO TEAM CHAMPIONS: The Dragon Force National Karate Demo Team are the 2012 World Fall Classic Martial Arts Demo Team Champions! *** Well Done to Sensei Thompson, Michael Milliman, Patrick Johnston, Keegan Grinspoon, Kai Loree, Chris Altman, Dayjha Armstrong, Quinn Barson, Kai Cheek, Trent McGarrigle, Noah Caldon, and Jaclyn Nolen. The Following also won 2nd to 4th Place in Various Divisions: Michael Milliman, Patrick Johnston, Keegan Grinspoon, Kai Loree, Chris Altman, Dayjha Armstrong, Quinn Barson, Ellen Honeycutt, Nick Solt, Kai Cheek, Trent McGarrigle, Noah Caldon, Jaclyn Nolen and Alex Thomasson. Top Helpers/ Assistants: Mike Milliman, Patrick Johnston, Keegan Grinspoon, Lourie Altman, Allen Loree, Chris Altman. Top Videographers / Photographers: Stephen Johnston, Dan Elder, Lourie Altman. 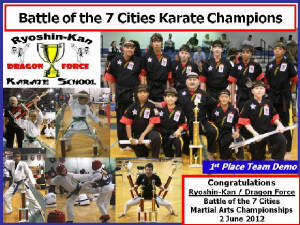 Congratulations to the Ryoshin-Kan Karate School's "Team Dragon Force" on an outstanding performance and Impressive Victory at the Battle of the 7 Cities Martial Arts Championships that were conducted at the Granby High School in Norfolk, Virginia on 2 June 2012. 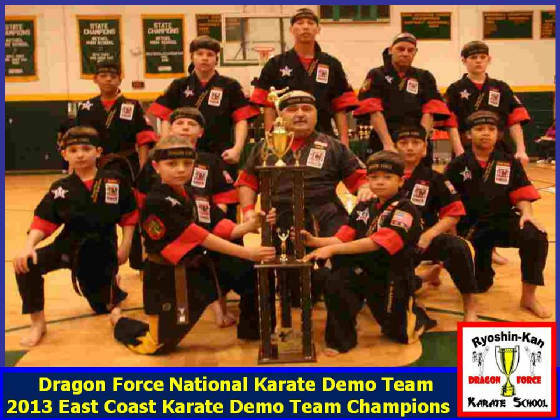 Dragon Force National Karate Team won the 1st Place Team Demo Trophy. Well Done to Sensei Thompson, Michael Milliman, Keegan Grinspoon, Kai Loree, Chris Altman, Patrick Johnston, Joe Ramirez, Demetria Ramirez, Ellen Honeycutt, Quinn Barson, Stephen Johnston, Dayjha Armstrong, Kai Cheek, Noah Caldon, Jaclyn Nolen, and David Hummel. 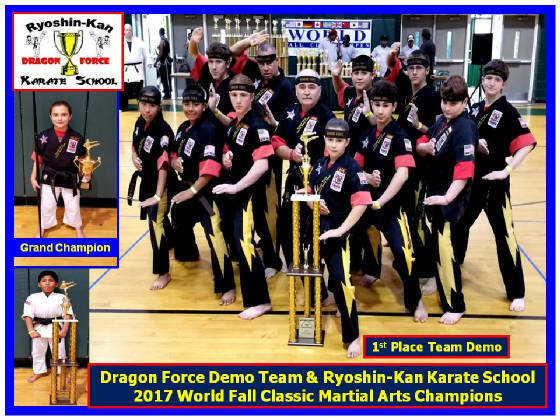 We had 38 Folks from Ryoshin-Kan / Team Dragon Force including 16 competitors who won a total of 35 Trophies including 6 First Place in Team Demo, Weapons, Kata and Sparring. The Following won 2nd to 4th Place in Various Divisions: Michael Milliman, Kai Loree, Chris Altman, Patrick Johnston, Joe Ramirez, Ellen Honeycutt, Quinn Barson, Stephen Johnston, Dayjha Armstrong, Kai Cheek, Noah Caldon, Jaclyn Nolen, David Hummel. 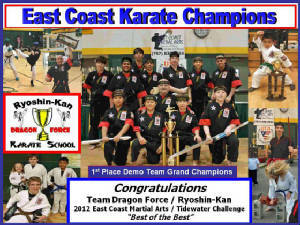 Congratulations and Well Done to the Ryoshin-Kan Karate School's "Team Dragon Force" on an outstanding performance and Impressive Victory at the 2012 East Coast Martial Arts Championships / Tidewater Challenge that was conducted at Bethel High School in Hampton, Virginia on 1 April 2012. We had a total of 59 Folks from Ryoshin-Kan Karate School, both Competitors and Parents / Relatives, that represented our Dojo to the highest level. Team Dragon Force had 18 competitors who won a total of 63 Trophies including 2 Grand Champions and 21 First Place. "When it was all said and done, Dragon Force Took home the hardware (1st Place Trophy)." Well Done to Sensei Tim Thompson, Sensei Michael Milliman, Sempai Maurice Reed, Sempai Keegan Grinspoon, Kai Loree, Chris Altman, Patrick Johnston, Joe Ramirez, Demetria Ramirez, Quinn Barson, Stephen Johnston, Dayjha Armstrong, Sempai Lynwood Yeatts, Ellen Honeycutt, Christinia Altman, Steven Altman, Nick Solt, Christy Green, Kai Cheek, Noah Caldon, Jaclyn Nolen and Elijha Herndon. We had 59 Folks from Ryoshin-Kan / Team Dragon Force including 18 competitors who won a total of 63 Trophies including 2 Grand Champions and 21 First Place. OohYa! EAST COAST MARTIAL ARTS / TIDEWATER CHALLENGE DEMO TEAM CHAMPIONS: The Dragon Force National Karate Demo Team are the 2012 East coast Karate Demo Team Champions! *** Well Done to Sensei Thompson, Michael Milliman, Maurice Reed, Keegan Grinspoon, Kai Loree, Chris Altman, Joe Ramirez, Demetria Ramirez, Patrick Johnston, Quinn Barson, Stephen Johnston, Dayjha Armstrong. 1st PLACE Black Belt Teenager Self-Defense Team: Keegan Grinspoon, Maurice Reed, Patrick Johnston, Stephen Johnston. The Following also won 2nd to 4th Place in Various Divisions: Michael Milliman, Maurice Reed, Keegan Grinspoon, Kai Loree, Chris Altman, Patrick Johnston, Quinn Barson, Stephen Johnston, Dayjha Armstrong, Nick Solt, Christy Green, Kai Cheek, Noah Caldon, Jaclyn Nolen and Elijha Herndon. Top Helpers/ Assistants: Mike Milliman, Keegan Grinspoon, Lourie Altman, Steve Altman, Joe Ramirez, Chris Altman, Dayjha Altman. Top Videographers / Photographers: Stephen Johnston, Steve Altman, Christina Altman. 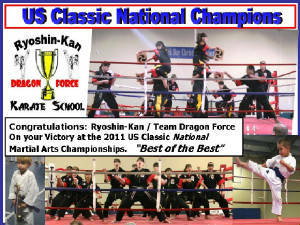 Congratulations and Well Done to the Ryoshin-Kan Karate School's "Team Dragon Force" on an outstanding performance and Impressive Victory at the US Classic National Open Karate Championships that were conducted in Virginia Beach, Virginia on 5 February 2012. We had a total of 65 Folks from Ryoshin-Kan Karate School, both Competitors and Parents / Relatives, that represented our Dojo to the highest level. 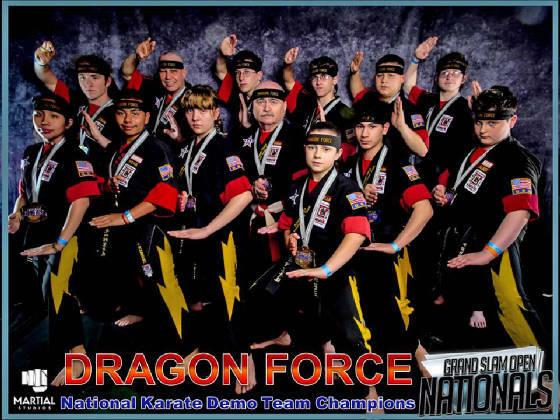 Ryoshin-Kan / Team Dragon Force had 23 competitors who won a total of 76 Trophies and Medals including Team Demo Grand Champion National Trophy and 45 First Place Trophies. Well Done to Sensei Tim Thompson, Sensei Michael Milliman, Sempai Lynwood Yeatts, Sempai Maurice Reed, Sempai Keegan Grinspoon, Kai Loree, Chris Altman, Patrick Johnston, Christinia Altman, Joe Ramirez, Demetria Ramirez, Quinn Barson, Hayden Bowles, Zachary Bowles, Ellen Honeycutt, Stephen Johnston, Dayjha Armstrong, Nick Solt, Kai Cheek, Noah Caldon, Jaclyn Nolen, Elijah Herndon, David Hummel. We had 65 Folks from Ryoshin-Kan/ Team Dragon Force including 23 competitors who won a total of 76 Trophies / Medals including Team Demo Grand Champion National Team Trophy and 45 First Place Trophies. OohYa! 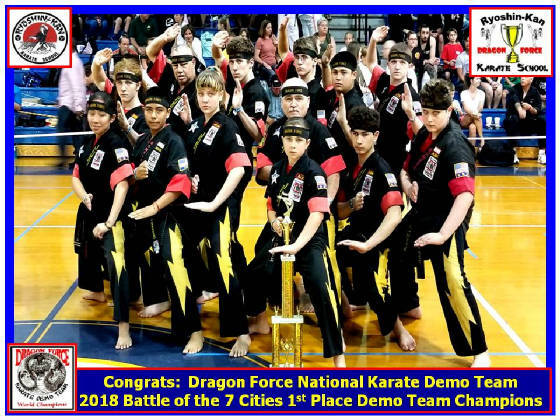 U.S. CLASSIC National Professional Karate Demo Team Grand Champions: The Dragon Force National Karate Demo Team was Awarded the US Classic National Professional Karate Demo Team 1st Place Grand Champion Trophy. *** Well Done to Sensei Thompson, Michael Milliman, Maurice Reed, Keegan Grinspoon, Kai Loree, Chris Altman, Joe Ramirez, Demetria Ramirez, Patrick Johnston, Stephen Johnston, Quinn Barson and Dayjha Armstrong. 1st PLACE Black Belt Self-Defense Team: Maurice Reed, Keegan Grinspoon, Kai Loree, Chris Altman, Patrick Johnston, Stephen Johnston, Quinn Barson, Dayjha Armstrong, Zachary Bowles. The Following also won 2nd to 4th Place in Various Divisions: Michael Milliman, Maurice Reed, Keegan Grinspoon, Kai Loree, Chris Altman, Patrick Johnston, Joe Ramirez, Quinn Barson, Hayden Bowles, Zachary Bowles, Ellen Honeycutt, Stephen Johnston, Kai Cheek, Noah Caldon, Jaclyn Nolen, Elijah Herndon, David Hummel. Special Thank You for Tournament Help (Admin / Construction / Score keeping, Transportation /Load Out, etc...): Michael Milliman, Lourie Altman, Christina Altman, Chris Altman, Allen Loree, Nina Loree, Stephen Johnston, Anne Johnston, Sharon Elder, Keegan Grinspoon. "Awesome Performance by Team Ryoshin-Kan / Dragon Force!" 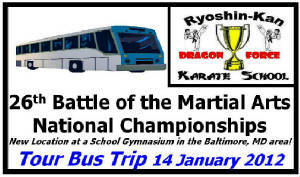 Congratulations and Well Done to the Ryoshin-Kan Karate School's "Team Dragon Force" on an outstanding performance and Impressive Victory at the 26th Battle of the Martial Arts National Championships that were conducted in Middle River, Maryland on 14 January 2012. The New Venue in the School Gymnasium was Awesome. The Entire Dragon Force Demo Team, Ryoshin-Kan Students, Golden Sun Students, Parents and Friends rode a Tour Bus to the Event. It was Great. We had a total of 65 Folks from our Karate Group, both Competitors and Parents / Relatives, that represented our Dojo to the highest level. 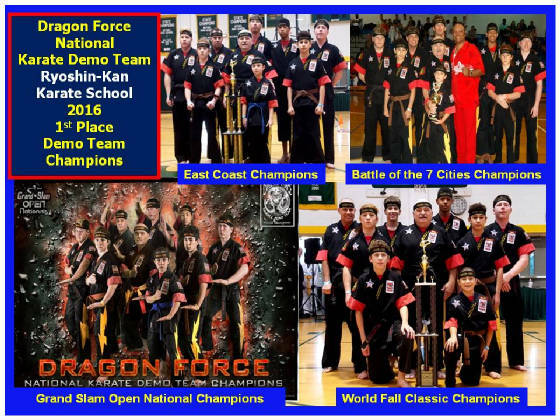 Team Dragon Force had 14 competitors who won a total of 35 Trophies and Medals including 2 Grand Champion National Trophies and 15 First Place Trophies. Well Done to Sensei Tim Thompson, Sensei Michael Milliman, Sempai Maurice Reed, Sempai Keegan Grinspoon, Kai Loree, Chris Altman, Patrick Johnston, Joe Ramirez, Demetria Ramirez, Quinn Barson, Ellen Gold, Stephen Johnston, Dayjha Armstrong and Jaclyn Nolen. 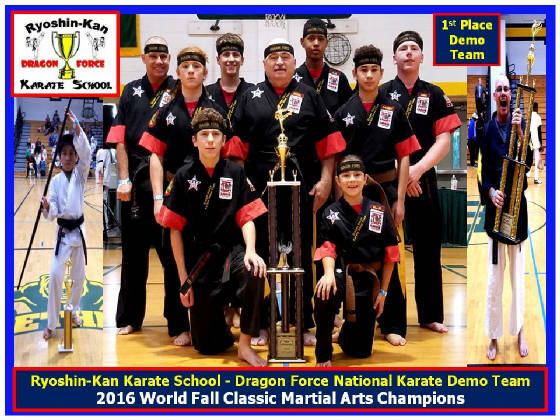 Ryoshin-Kan/ Team Dragon Force won a total of 35 Trophies / Medals including 2 Grand Champion National Team Trophies and 15 First Place Trophies. OohYa! 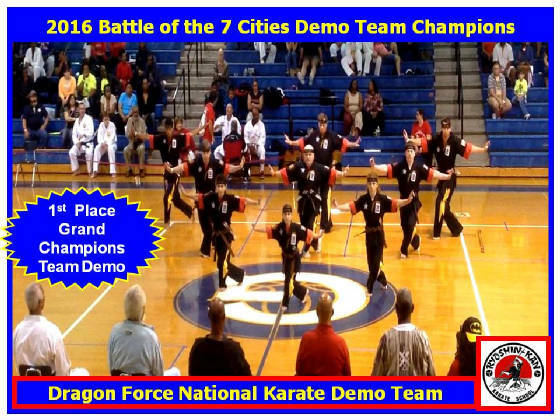 26th BATTLE OF THE MARTIAL ARTS NATIONAL DEMO TEAM GRAND CHAMPIONS: The Dragon Force National Karate Demo Team was Awarded the 26th Battle of the Martial Arts National Demo Team Grand Champion Trophy for an Awesome Demo Team Performance. *** Well Done to Sensei Thompson, Michael Milliman, Maurice Reed, Keegan Grinspoon, Kai Loree, Chris Altman, Joe Ramirez, Demetria Ramirez, Patrick Johnston, Quinn Barson, Stephen Johnston and Dayjha Armstrong. The Following also won 2nd to 4th Place in Various Divisions: Michael Milliman, Maurice Reed, Keegan Grinspoon, Kai Loree, Chris Altman, Patrick Johnston, Joe Ramirez, Demetria Ramirez, Quinn Barson, Stephen Johnston, Dayjha Armstrong, Jaclyn Nolen. 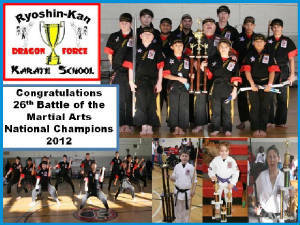 Special Thank You: to Lourie Altman for keeping track / writing down how each Ryoshin-Kan student did in the Tournament. Special Thank You: Stephen Johnston Family and Steve Altman Family for taking photos and video at the Tournament. 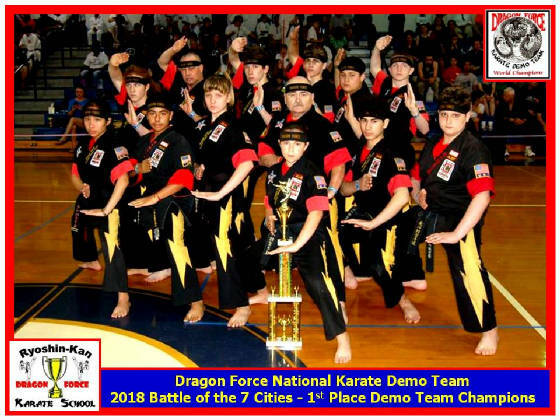 Dragon Force National Karate Demo Team Won Grand Champion / 1st Place Team Demo Trophies at Six World, National and Regional Karate Tournaments in 2011. 2011 World Fall Classic Karate Champions! Team Dragon Force Rocked the 2011 US Gladiator Challenge! 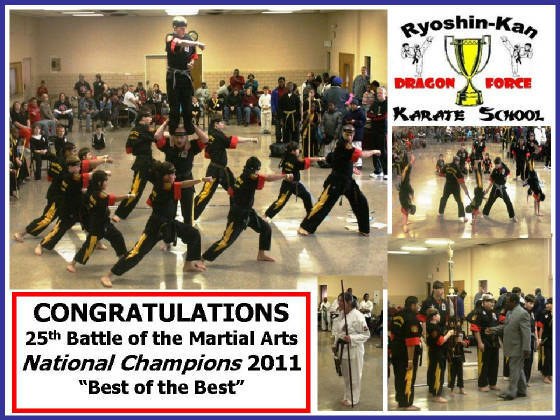 Congratulations to Ryoshin-Kan / Team Dragon Force on an Impressive Victory at the 2011 US Classic National Martial Arts Championships. 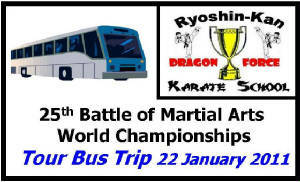 This was a Great Tournament and Ryoshin-Kan / Team Dragon Force did very Well in Team Demo, Kata, Weapons, Sparring. 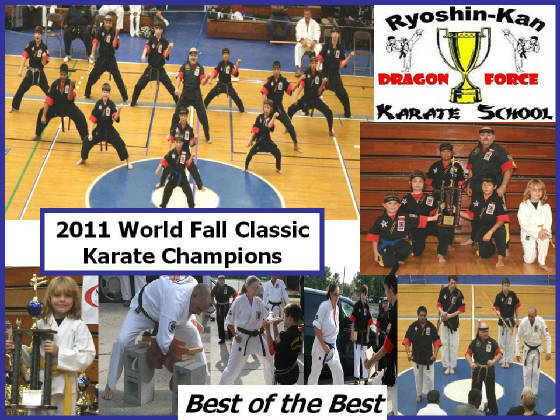 Congratulations and Well Done to the Ryoshin-Kan Karate School's "Team Dragon Force" on an outstanding performance and Impressive Victory at the 2011 World Fall Classic Martial Arts Championships that were conducted at Hampton University in Hampton, Virginia on 9 October 2011. We had a total of 41 Folks from Ryoshin-Kan Karate School, both Competitors and Parents / Relatives, that represented our Dojo to the highest level. Team Dragon Force had 16 competitors who won a total of 48 Trophies including 21 First Place. 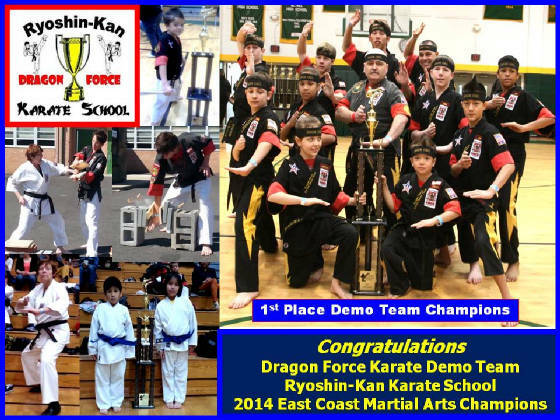 The Dragon Force / Ryoshin-Kan Karate Team did outstanding in all Divisions. All of you are Karate Champions! Well Done to Sensei Tim Thompson, Sensei Michael Milliman, Sempai Maurice Reed, Sempai Keegan Grinspoon, Kai Loree, Chris Altman, Patrick Johnston, Joe Ramirez, Demetria Ramirez, Quinn Barson, Ellen Honeycutt, Stephen Johnston, Dayjha Armstrong, Christy Green, Titus Butler, and Jaclyn Nolen. We had 41 Folks from Ryoshin-Kan / Team Dragon Force including 16 competitors who won a total of 48 Trophies including 21 First Place. OohYa! WORLD FALL CLASSIC MARTIAL ARTS DEMO TEAM CHAMPIONS: The Dragon Force National Karate Demo Team are the 2011 World Fall Classic Martial Arts Demo Team Champions! *** Well Done to Sensei Thompson, Michael Milliman, Maurice Reed, Keegan Grinspoon, Kai Loree, Chris Altman, Joe Ramirez, Demetria Ramirez, Patrick Johnston, Quinn Barson, Stephen Johnston, Dayjha Armstrong and Titus Butler. The Following also won 2nd to 3rd Place in Various Divisions: Michael Milliman, Maurice Reed, Keegan Grinspoon, Kai Loree, Chris Altman, Patrick Johnston, Demetria Ramirez, Quinn Barson, Ellen Honeycutt, Stephen Johnston, Dayjha Armstrong. Top Videographers / Photographers: Stephen Johnston, Dan Elder, Christina Altman. 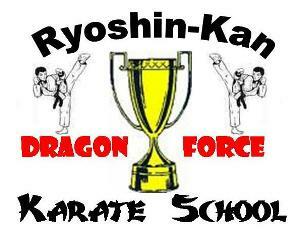 Team Ryoshin-Kan / Dragon Force!" 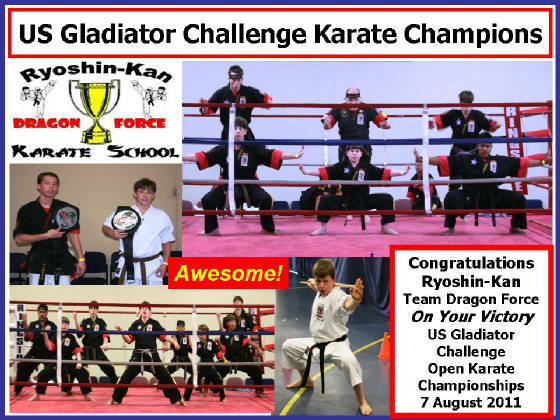 Congratulations and Well Done to the Ryoshin-Kan Karate School's "Team Dragon Force" on an outstanding performance and Impressive Victory at the US Gladiator Challenge Karate Championships that were conducted at the Back Bay Christian Church Gym in Virginia Beach, Virginia on 7 August 2011. We had a total of 25 Folks from Ryoshin-Kan Karate School, both Competitors and Parents / Relatives, that represented our Dojo to the highest level. 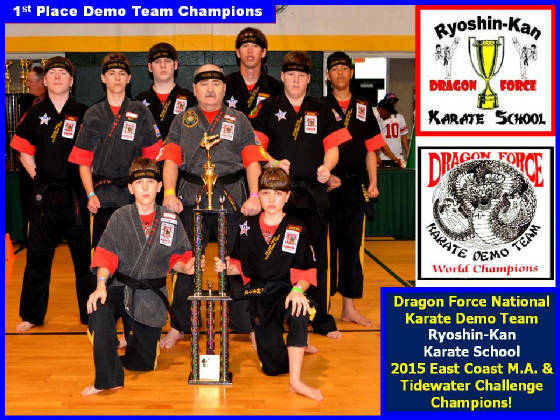 Ryoshin-Kan / Team Dragon Force won a total of 32 Trophies and Medals including 21 First Place Trophies, 6 Champion Belts and a Team Demo Champion Plaque Award. We had 25 Folks from Ryoshin-Kan/ Team Dragon Force, who won a total of 32 Trophies / Medals including 21 First Place Trophies, 6 Champion Belts and a Team Demo Champion Plaque Award. OohYa! Special Thank You for Tournament Help (Admin / Construction / Score keeping, Transportation /Load Out, etc...): Lourie Altman, Lynwood Yeatts, Maurice Reed, Chris Altman, Christinia Altman, Joe Ramirez, Demetria Ramirez, Quinn Barson, Dayjha Armstrong. 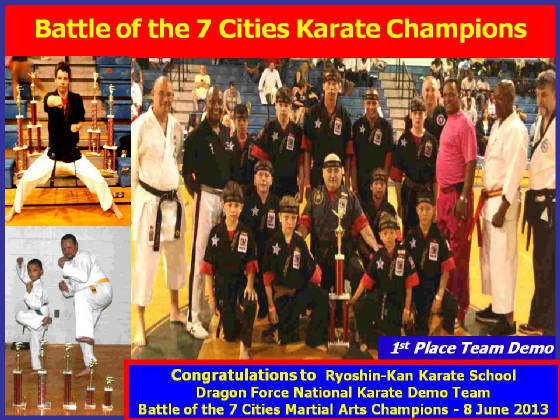 Congratulations and Well Done to the Ryoshin-Kan Karate School's "Team Dragon Force" on an outstanding performance and Impressive Victory at the 2011 Battle of the 7 Cities Martial Arts Championships that were conducted at the Granby High School in Norfolk, Virginia on 4 June 2011. Well Done to Sensei Thompson, Sempai Maurice Reed, Sempai Keegan Grinspoon, Kai Loree, Chris Altman, Patrick Johnston, Joe Ramirez, Demetria Ramirez, Quinn Barson, Shelby Robinson, Stephen Johnston, Dayjha Armstrong, Titus Butler, Christy Green and Kendan Benson. We had 32 Folks from Ryoshin-Kan / Team Dragon Force including 15 competitors who won a total of 34 Trophies including 10 First Place. The Following won 2nd to 4th Place in Various Divisions: Maurice Reed, Keegan Grinspoon, Kai Loree, Chris Altman, Patrick Johnston, Joe Ramirez, Demetria Ramirez, Quinn Barson, Shelby Robinson, Stephen Johnston, Titus Butler, Christy Green and Kendan Benson. 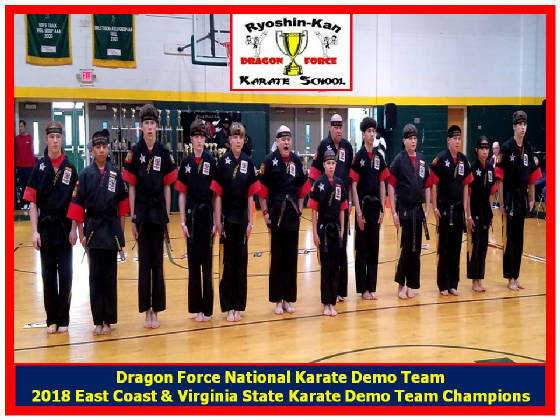 Congratulations and Well Done to the Ryoshin-Kan Karate School's "Team Dragon Force" on an outstanding performance and Impressive Victory at the 2011 East Coast Martial Arts Championships / Tidewater Challenge that were conducted at the Bethel High School in Hampton, VA. on 3 April 2011. We had a total of 52 Folks from Ryoshin-Kan Karate School, both Competitors and Parents, that represented our Dojo to the highest level. Team Dragon Force had 18 competitors who won a total of 58 Trophies including 21 First Place. Well Done to Sensei Tim Thompson, Sempai Lynwood Yeatts, Sempai Maurice Reed, Sempai Keegan Grinspoon, Kai Loree, Chris Altman, Patrick Johnston, Christinia Altman, Joe Ramirez, Demetria Ramirez, Quinn Barson, Ellen Gold. Stephen Johnston, Shelby Robinson, Dayjha Armstrong, Christy Green, Nick Solt, Titus Butler and Kendan Benson. We had 52 Folks from Ryoshin-Kan / Team Dragon Force including 18 competitors who won a total of 58 Trophies including 21 First Place. The Following also won 2nd to 4th Place in Various Divisions: Maurice Reed, Keegan Grinspoon, Kai Loree, Chris Altman, Patrick Johnston, Joe Ramirez, Demetria Ramirez, Quinn Barson, Ellen Gold. Stephen Johnston, Shelby Robinson, Christy Green, Titus Butler and Kendan Benson. Special Thank You for Tournament Help (Transportation /Load Out, etc...): Lourie Altman, Steve Altman, Christina Altman, Chris Altman, Stephen Johnston, Anne Johnston, Patrick Johnston, Stephen Johnston Jr, Dan Elder, Sharon Elder, Keegan Grinspoon and Joe Ramirez. Congratulations and Thank You to all Ryoshin-Kan Students, Participants, Parents and friends. 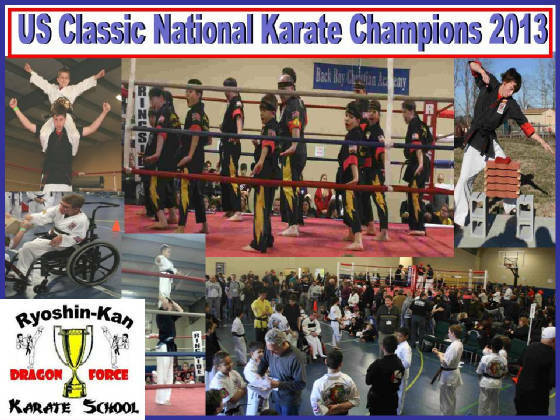 Congratulations and Well Done to the Ryoshin-Kan Karate School's "Team Dragon Force" on an outstanding performance and Impressive Victory at the US Classic National Martial Arts Championships that were conducted in Virginia Beach, Virginia on 6 February 2011. We had a total of 68 Folks from Ryoshin-Kan Karate School, both Competitors and Parents / Relatives, that represented our Dojo to the highest level. 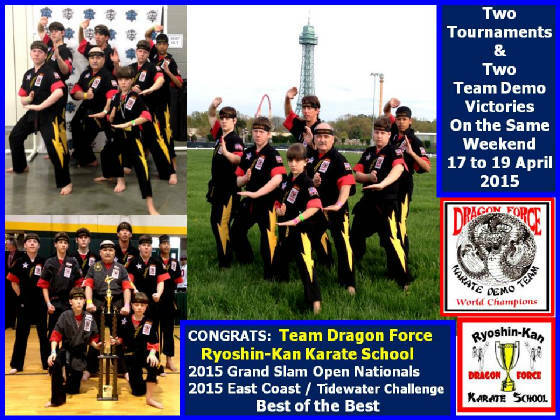 Ryoshin-Kan / Team Dragon Force had 25 competitors who won a total of 72 Trophies and Medals including Team Demo Grand Champion National Trophy and 64 First Place Trophies. Well Done to Sensei Tim Thompson, Sensei Michael Milliman, Sempai Lynwood Yeatts, Sempai Maurice Reed, Sempai Keegan Grinspoon, Kai Loree, Chris Altman, Patrick Johnston, Christinia Altman, Joe Ramirez, Demetria Ramirez, Quinn Barson, Hayden Bowles, Zachary Bowles, Ellen Gold. Stephen Johnston, Dayjha Armstrong, Christy Green, Nick Solt, Titus Butler, Ethan Fekete, Kendan Benson, Mikail Bonham, Dann'tae Palmer, Nick Smith-Lewis, Dannie Palmer. We had 68 Folks from Ryoshin-Kan/ Team Dragon Force including 25 competitors who won a total of 72 Trophies / Medals including Team Demo Grand Champion National Team Trophy and 64 First Place Trophies. OohYa! 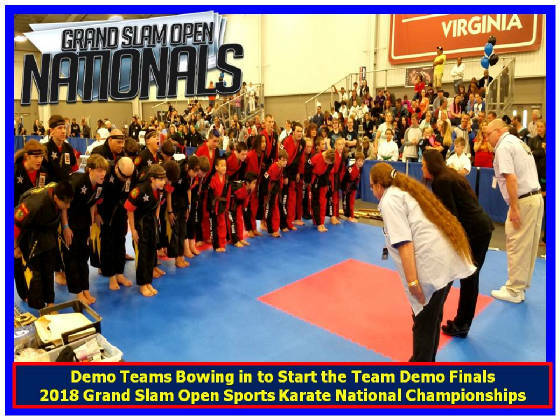 U.S. CLASSIC NATIONAL MARTIAL ARTS DEMO TEAM GRAND CHAMPIONS: The Dragon Force National Karate Demo Team was Awarded the US Classic National Martial Arts Demo Team 1st Place Grand Champion Trophy. The Following also won 2nd to 4th Place in Various Divisions: Keegan Grinspoon, Kai Loree, Chris Altman, Patrick Johnston, Joe Ramirez, Demetria Ramirez, Hayden Bowles, Mikail Bonham, Dann'tae Palmer. Special Thank You for Tournament Help (Admin / Construction / Score keeping, Transportation /Load Out, etc...): Michael Milliman, Lourie Altman, Steve Altman, Christina Altman, Chris Altman, Allen Loree, Chikako Loree, Nina Loree, Stephen Johnston, Anne Johnston, Dan Elder, Sharon Elder, Keegan Grinspoon. Congratulations and Well Done to the Ryoshin-Kan Karate School's "Team Dragon Force" on an outstanding performance and Impressive Victory at the 25th Battle of the Martial Arts National Championships that were conducted Dundalk, Maryland on 22 January 2011. Most of our Team Dragon Force / Ryoshin-Kan rode a Tour Bus with two other Schools including Kyoshi Montez Dennis Golden Sun Dojo to the Event. It was Great. Grand Master Howard Moore ran an Outstanding 25th Battle of the Martial Arts National Martial Arts Championships. We had a total of 38 Folks from Ryoshin-Kan Karate School, both Competitors and Parents / Relatives, that represented our Dojo to the highest level. 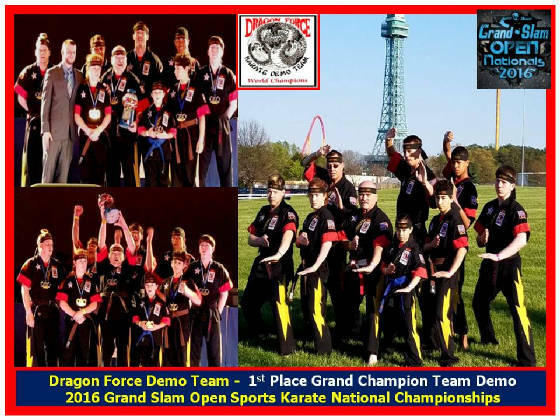 Team Dragon Force had 13 competitors who won a total of 34 Trophies and Medals including 1 Grand Champion National Trophy and 9 First Place Trophies. Well Done to Sensei Tim Thompson, Sensei Michael Milliman, Sempai Maurice Reed, Sempai Keegan Grinspoon, Kai Loree, Chris Altman, Patrick Johnston, Joe Ramirez, Demetria Ramirez, Quinn Barson, Ellen Gold, Stephen Johnston, Dayjha Armstrong and to all Parents, Relatives and Guest. We had 38 Folks from Ryoshin-Kan/ Team Dragon Force including 13 competitors who won a total of 34 Trophies / Medals including 1 Grand Champion National Team Trophy and 9 First Place Trophies. OohYa! 25th BATTLE OF THE MARTIAL ARTS NATIONAL DEMO TEAM GRAND CHAMPIONS: The Dragon Force National Karate Demo Team was Awarded the 25th Battle of the Martial Arts National Demo Team Grand Champion 6 Foot Trophy for our Awesome Demo Team Performance. Watch Dragon Force's Awesome Demo Team Performance on Youtube. The Following also won 2nd to 4th Place in Various Divisions: Michael Milliman, Maurice Reed, Keegan Grinspoon, Kai Loree, Chris Altman, Patrick Johnston, Joe Ramirez, Demetria Ramirez, Quinn Barson, Stephen Johnston, Dayjha Armstrong. Special Thank You: to Allen Loree for doing a Super Job as Score Keeper. Special Thank You: to Johnston Family for bringing Team Dragon Force's Sound System. Good Thing that we had it, because we had to use it when the Tournament's system Failed.